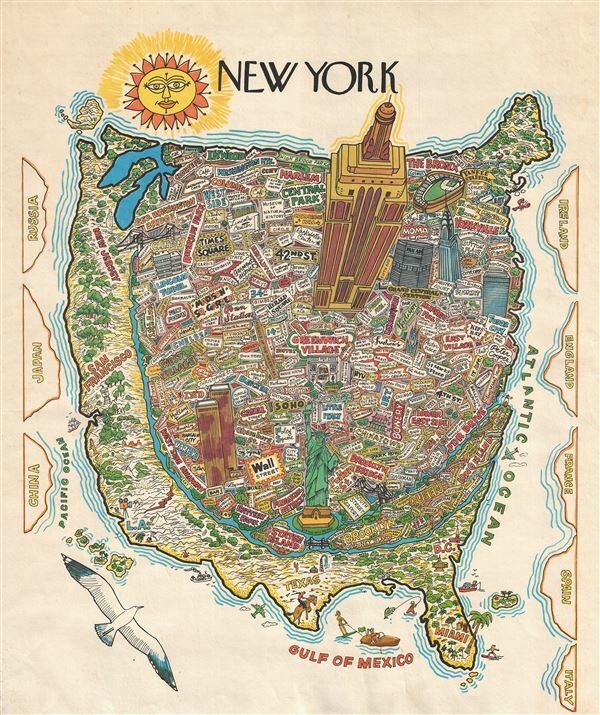 Curious pictorial map showing New York City and the United States as percieved by a New Yorker. An uncommon pictorial map most likely dating from the early 1970s. This map follows in the model of 'The New Yorker's Idea of the United States of America' established by Daniel K. Wallingford in the 1930s. Under Wallingford's paradigm, maps are drawn on a scale of perceived importance. In this case New York City, presented as a bird's-eye view on an isometric projection, occupies most of the map. Important New York landmarks are noted throughout and sized accordingly - with the Empire State Building, the Statue of Liberty, Yankee Stadium, and the World Trade Center being particularly prominent. Although technically extending all the way to the west coast, the central part of the United States is in fact absent, although New Jersey, San Francisco, Los Angeles, Texas, and Washington D. C. and Miami do also appear prominently. International trading partners and vacations spots, including China, Russia, Japan, Ireland, France, and England appear around the edges. The publisher and artist remain unknown. Although presumably others must exist, the only other known archived example of this map is held in the David Rumsey Historical Map Collection at Stanford.